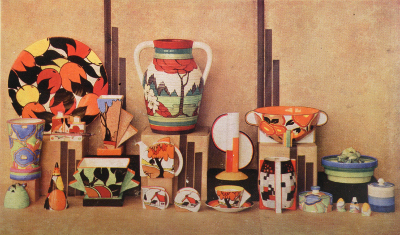 Clarice Cliff's beginnings were shared by thousands of girls and women of the early 1900s. She was just another factory girl, with a rolled-up pinny in her coat pocket and nothing much expected of her future, but the developm­ent of her narrative runs counter to theirs, confounding and disputing expectations. Within the stronghold of traditionalism and class that was the Staffordshire Potteries, her success was without precedent. Although other women emerged as designers during this period - most notably Susie Cooper - it was a working-class woman whose story captivated the press. Although Clarice Cliff's professional life was widely documented, she did not leave behind - and, most likely, did not write - the letters and journals that generally furnish the private lives of public individuals. Factory hours afforded little time for leisure, and working-class women were, in any case, not encouraged to write about themselves: their lives were hardly thought worthy of record. Clarice Cliff's silence is doubly insistent: by the time she had stories of her own, she had reason to withhold them. By the late 1920s, she was familiar with the snatched meetings and discreet hotels that characterise a relationship with a married lover. Clarice Cliff's story belongs not to London or Paris - although both cities figure within it - but to industrial Stoke-on-Trent, a harsh creative backdrop, with far less scope for the unconventional. An environmen­t of strong local flavours, its stamps its power upon the personalities it creates. Though the writer Vera Brittain knew Staffordshire only as a very young girl, she described herself as 'Staffordshire to the core'. 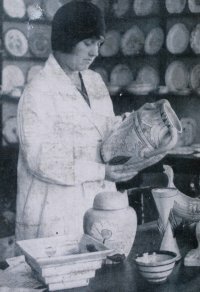 Clarice Cliff spent her life in the Potteries. Its social and cultural history is stitched into the fabric of her existence. Although she worked within a community, Clarice Cliff was neither part of the establishment nor an adherent of provincial codes, yet despite her apparent bravado, she was an intensely private woman. Hers was a life of contradictions in a period rife with contradictions of its own. The inter-war years ushered in the modern; the advent of the wireless and talking films revolutionised communication and changed the cultural fabric; mass production and labour-saving devices overhauled domestic and industrial life. Art, literature and design thrilled with the new, old forms were overthorwn and risks embraced, but this was only part of the picture. Those years were also characterised by economic uncertainty, the Depression and social flux - by retrenchment as well as possibility. For most women of the period, the 1920s and '30s were years of restricted employment opportunities and rigid social and sexual mores. The penalties for those who transgressed were great; in small provincial towns, like those comprising the Potteries, the risks were even greater. Good design does not draw attention to itself, and nor should women, so say tenets of the period (and thereafter). 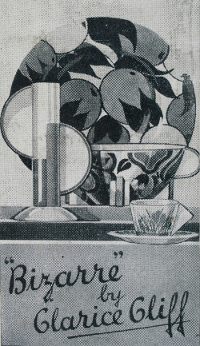 Yet Clarice Cliff's exclamatory designs could take away the breath. Though her vocabulary was domestic tableware, she was nevertheless a radical, a mo­dernist in spirit, if not in the capitalised letters of design terminology. Like many modernists, she was an outsider, reconfiguring the landscape, extending and reshaping the boundaries of professional life for women. There were too few women like her for Clarice Cliff to fit comfortably within her milieu. Most women leave to break the rules; Clarice Cliff stayed and broke them. Who was the woman in the black skull cap, to whom 'romance' so readily attached itself? Who was the 'brilliant young girl artist', Clarice Cliff?